General Eclectic: Marvelous Tales – Joanne, Get Back to Work! Marvelous Tales – Joanne, Get Back to Work! The copy below is taken (and revised a bit) from the Friends of Ol’ Marvel Facebook ”What Made “the Old” Marvel Fun” discussion board to explain this set of photos. 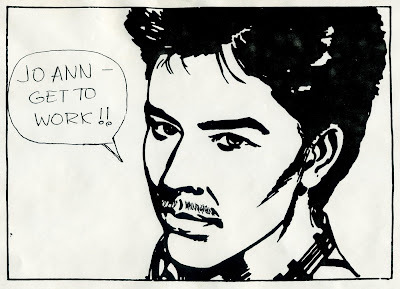 From ’87-’88, Joanne Spaldo was my Assistant Editor at Marvel. She had at LEAST three male assistant editors who were smitten with her and who were constantly vying for her attention. They would rotate through my office throughout day, distracting Joanne from her editorial duties for extended periods. On more than one occasion I’d say “Joanne, let’s get back to work now.” That was usually enough of a hint for the amorous male assistant of the moment to exit for a while. If that didn’t work, I’d ask the assistant if, since they had so much time on their hands, perhaps they could help with some of my office’s work. However, not long after one of the male assistants would leave, another of the ranks of the smitten would pop in. 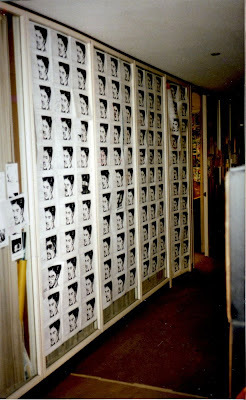 When I returned from a business trip, I found that every surface in my office had been covered with Xeroxes of my face with “Joanne, get back to work.” written on them. They were even in the light fixtures! It was impossible to get any work done with the office totally covered, so a lot of them came down later that day.Various staffers had further customized some of the Xeroxes. I picked the best of those and taped them up on the glass wall. I found most of the photos I had of the office and have posted them here. There is another one I remember that I have not yet located. I’m not sure who took these shots so I can’t credit them. If you were the photographer, please let me know. 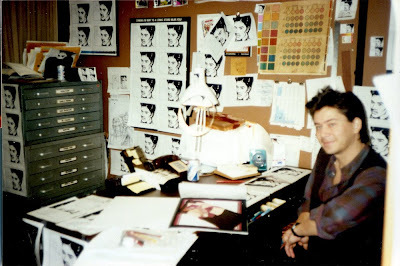 This was the creative and fun atmosphere that the Marvel's creative/editorial/production crew lived in and perpetuated for many years. Marvel had a culture that fostered creativity, camaraderie, harmless (mostly!) pranks and a love of the workplace that many companies could benefit from. I count myself lucky to have been a part of it and hope those of you who were not so lucky will get an idea of what it was like from posts on this blog. Coincidentally (? ), this was also an extremely productive and profitable period for the company. You can read about more Marvel shenanigans on Facebook's Friends of Ol’ Marvel ”What Made “the Old” Marvel Fun” discussion board. The sight that greeted me as I arrived early that day, before anyone else had arrived. 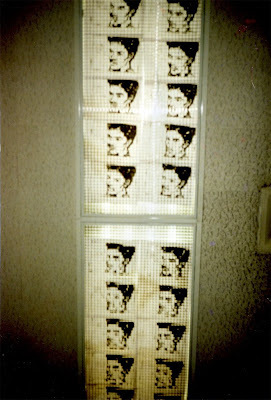 The portrait that was Xeroxed a gazillion times. Art by Brent Anderson (from Strikeforce: Morituri?). Someone else added the moustache. Anyone recognize the handwriting, hmm? Windows, bookcases – almost everything was covered. Even my model pterodactyl has one hanging from it. Only the fish tanks were spared. 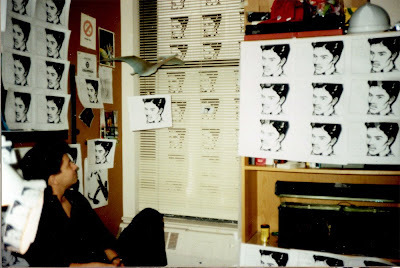 I believe that even the front of the flat files had been covered but, by the time this shot was taken, we had to get some work done so the Xeroxes taped to the drawers had come down. Even the ceiling light fixtures were covered – from the inside! That took some doing. I found this blog a few weeks ago and love reading all of the posts about Marvel in the '80s. I grew up reading your Punisher War Journal issues (my brother and I read the two-parter with Wolverine until the covers fell off). I hope you keep the blog up for a long time. Damn Carl, you look so young!!!! *Ducking* Great story!!! Those really WERE the days! Glad to see you connect the FUN with the PROFIT. I believe very few people(other than those who were there at the time) see how much the two were connected.